Telling the true story of 7,000 stranded air passengers during the wake of 9/11, and the small town in Newfoundland that welcomed them, will be Jenna Boyd (Beulah and others), Nathanael Campbell (Bob and others), Clive Carter (Claude and others), Mary Doherty (Bonnie and others), Robert Hands (Nick/Doug and others), Helen Hobson (Diane and others), Jonathan Andrew Hume (Kevin J/Ali and others), Harry Morrison (Oz and others), Emma Salvo (Janice and others), David Shannon (Kevin T/Garth and others), Cat Simmons (Hannah and others) and Rachel Tucker (Beverley/Annette and others) with Mark Dugdale, Bob Harms, Kiara Jay, Kirsty Malpass, Tania Mathurin, Alexander McMorran, Brandon Lee Sears and Jennifer Tierney. 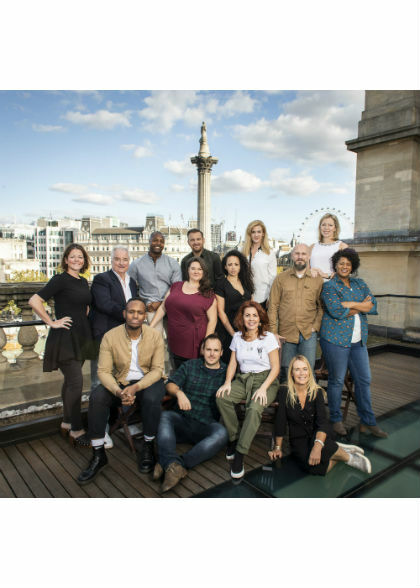 Prior to its West End engagement at the Phoenix Theatre from 30 January 2019, Come From Away will have a limited run at the Abbey Theatre in Dublin from 6 December 2018 to 19 January 2019. Come From Away is produced in the UK and Ireland by Junkyard Dog Productions and Smith & Brant Theatricals. The European premiere of Come From Away will be presented in partnership with the Abbey Theatre Dublin.